The lake next to the Courtyard had previously been home to the Swan Boats, prior to their removal at the end of 2003. They were replaced by the pay-per-ride Splash Kart Challenge, which involved self-controlled powered boats racing around a short course. The Splash Karts, which will not be missed, were removed at the end of 2007 to make way for Battle Galleons. It's important to note that you can have a lot of fun with Battle Galleons without ever entering the queue line. There are quite a few jetties around the perimeter of the course, with hand-powered water guns which spectators can use to soak guests on the ride. 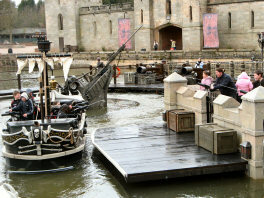 However, the people on the boats can fire back - so be aware that you can get very wet despite not having been on the ride! Those brave enough to give the ride a go are taken through a long, winding queue line, which goes up and around a building, and down into a large galleon. There are guns here too and plenty to look at, so if you ever do have to wait a little while, it will still be entertaining. Once you reach the station, you board your boat four at a time, one group on each side. You then set off along the course which lasts around three minutes. The guns on the boats, like the spectator ones, are hand-powered so it can get quite tiring after a while. You can shoot at other boats, spectators, or targets along the course. These usually reward you by activating a water effect, which can sometimes actually soak you more! If you do go on this ride, be aware that you will get drenched - a dryer is provided at the exit though, which is very handy. Overall, Battle Galleons is a fantastic family attraction, which adults and kids alike will love.